A second member of the Latvian parliament had his parliamentary immunity lifted June 21 as a result of another urgent request from law enforcement. Yesterday the subject of frantic parliamentary action was rebel MP Artuss Kaiminš, who is reported to have spent the night in police custody on suspicion of illegal party financing - though no formal charges have yet been brought. Today it was the turn of Askolds Kļavinš from the same Greens and Farmers Union (ZZS) political bloc as Prime Minister Māris Kučinskis. According to the document submitted for immediate consideration after 6 p.m. of the Saeima chamber by the Saeima's mandate and ethics committee, the request was "To consent to a personal search, to start a search in the person's declared place of residence, in a car in the person's use and to view the items removed as a result of the search, as well as for removing and checking the car." The document said the request for permission to carry out searches had come from the Prosecutor General. Kļavinš himself was first to address the Saeima, stammering that the motion before the house was "a surprise" and speculating if it might be something to do with a change in his declared place of residence and associated fuel use for his car. He told the Saeima he really does live in Liepāja and is there "every week". "But I would ask you to support this request so that everything can be checked out and cleared up," he said. 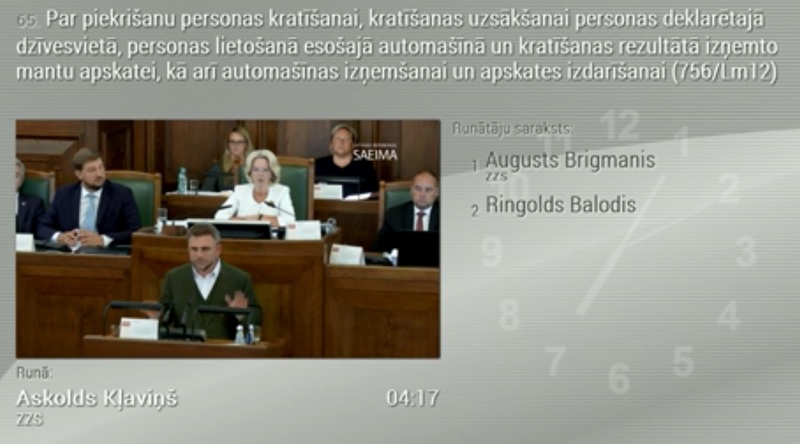 ZZS parliamentary leader Augusts Brigmanis said he had "full confidence" in both Kļavinš and in law enforcement agencies' abilities to do their jobs. Though the motion was carried, some members did object to the way requests for parliamentary immunity to be lifted were happening with no notice and little information about the precise circumstances of each case. "Yesterday was absurd and today the absurdity continues," said Janis Adamsons of the Harmony party. With 80 of 100 deputies present, the motion passed by 61 votes to zero. In what looks likely to be the same case, the Corruption Prevention and Combating Bureau on June 21 said in a statement, "within the framework of criminal proceedings initiated by KNAB, permission was requested of Saeima to conduct criminal proceedings against a Saeima deputy. Criminal proceedings have been initiated on alleged intentional acts committed by a public official in the course of their duties" which had caused "significant damage to state power or management arrangements" and which is classed as a serious criminal act.